Home Promos and Raffles Want to Shop and Get a Free Nokia C5? Want to Shop and Get a Free Nokia C5? Are you a shopaholic or do you just want to take a peek on the latest sales and discounts? Well if you do then check out Manila Shopaholic. This is not only a blog but also a site for the latest trends, hip and of course the sales and discounts that everybody loves. That's not all this cool website is offering FREE NOKIA C5 to a lucky reader. Yes, Manila Shopaholic will be giving out a free Nokia C5 to one lucky reader courtesy of Nokia Philippines. So what's a Nokia C5? Well this is one cool phone which you will be very proud to own. This phone is quad band with a MicroSD memory card slot, hot swappable, up to 16 GB and an internal memory of up to 50 MB. 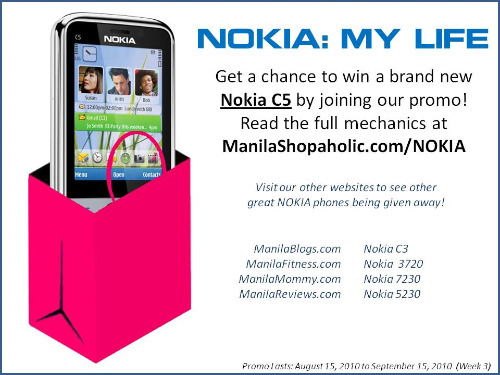 So do you want to get a chance to own a Nokia C5 for free, then check out Manila Shopaholic asap.